Living in New York State, we are lucky that we have a lot of apple orchards around us. 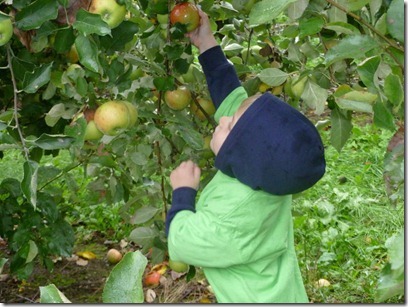 Not only can we get fresh apples during the right season, but in many instances we can go and pick our own. 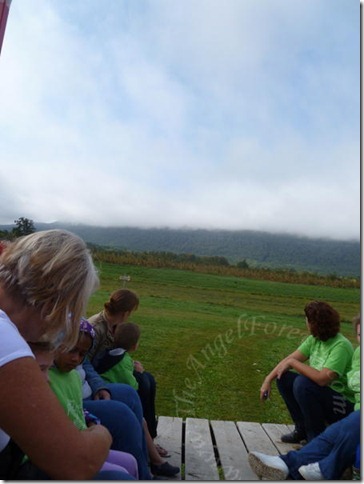 Last year, JSL’s school was supposed to go on a trip. Thanks to the weather, it was canceled. 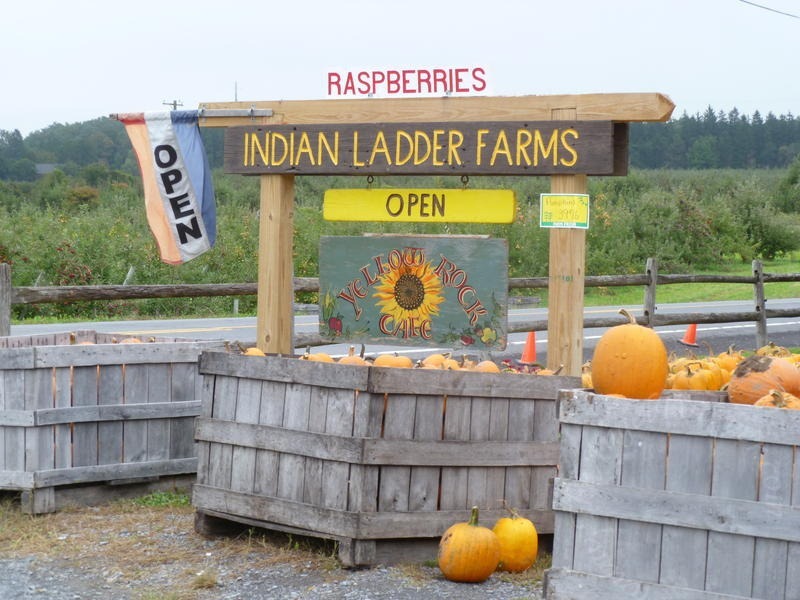 This year, we hoped that the weather would behave and the kids would be able to go apple picking at Indian Ladder Farms. When we got up Wednesday morning, the fog was thick and it was pretty wet outside. 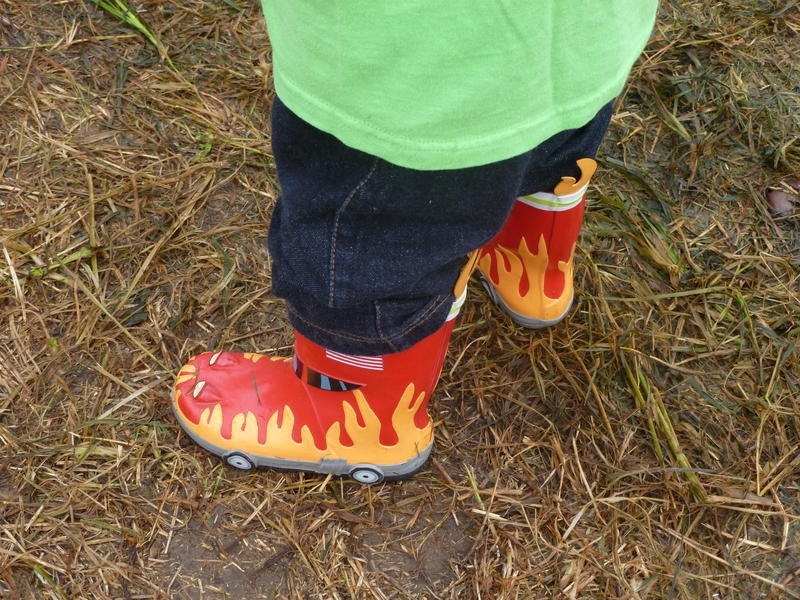 A light drizzle was in the air, but nothing too bad. Thanks to this, the ground was not very nice, but it could have been a lot worse. 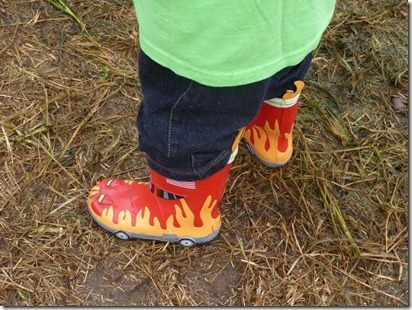 JSL wore his boots and was all set to go. 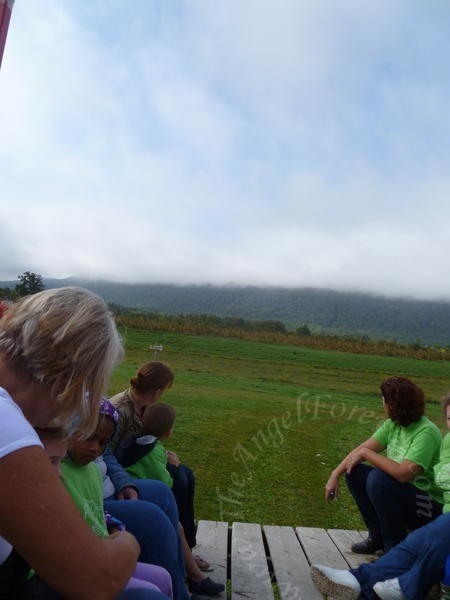 I had worried that we may arrive late since we had to travel a bit after dropping NHL off to school, but we made it in time and were able to wait with the other kids and families there for the fun morning. While we were waiting for everyone else to arrive, we decided to buy a bag to pick some extra apples for home. 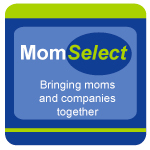 The main reason we opted to do this is thanks to the selection that would be picked today. 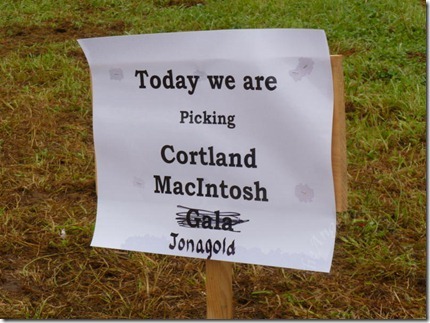 The Jonagold are a favorite and we hoped to find some of these to share with TechyDad and NHL. 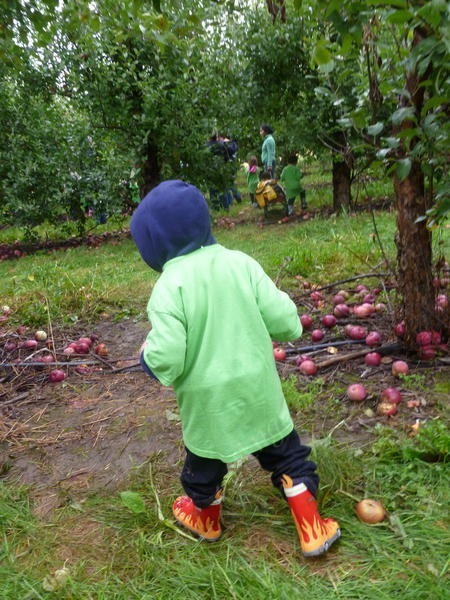 The little guy was very excited to get into the fields to pick some apples. We quickly realized that he was smart to keep his hood up. 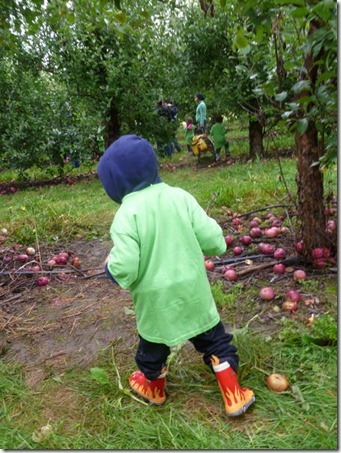 Thanks to the damp morning, you were rained on as you pulled the apples off the branches. 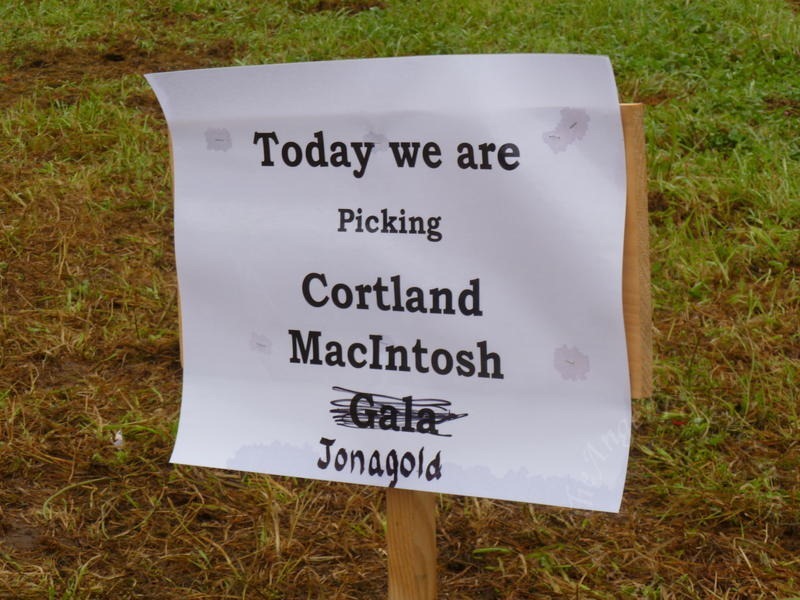 Not to worry though, JSL thought this was pretty funny and got into the apple picking. Some of the trees were not in the best of shape. 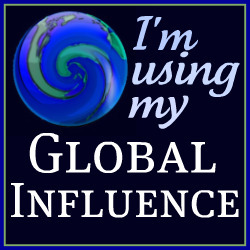 I’m not sure if this is because they were already picked over, or if Hurricane Irene had something to do with it. 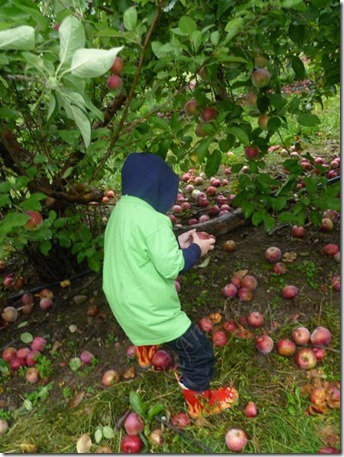 JSL and I still managed to move a few rows into the trees and found lots of apples to take home. Going alone with the little guy was special. 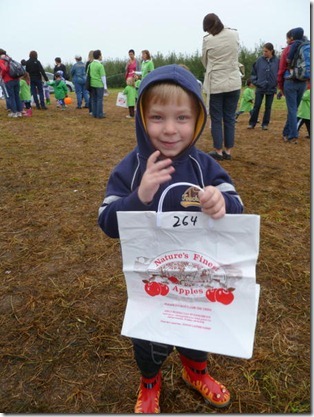 He was so proud to pick apples on his own and put them into our big bag. 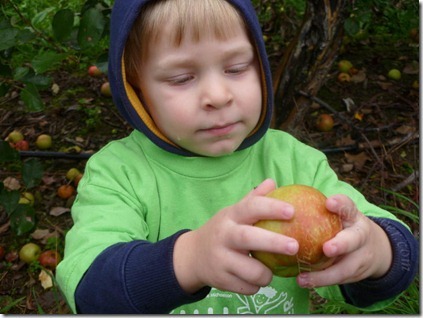 At one point, I made sure to stop him for a photo with an apple that he had plucked off a tree. Before too long, our bag was filled and it was time to head to our car. Yes, we have a good amount of apples to hold us over until we are able to go apple picking with the entire family. 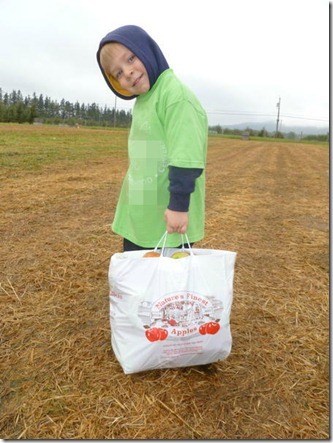 The little guy was so upset that he could not lift the bag, but I told him it just meant that we did a really good job. After moving the car, the classes took turns going on a hayride around the fields behind the big store/barn. 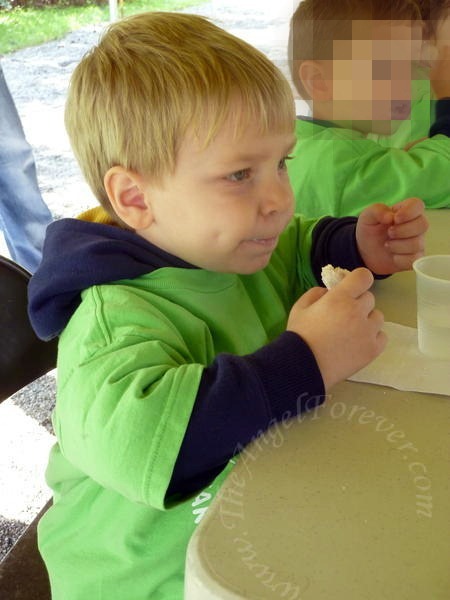 Then, we had snacks under a tent – JSL enjoyed the donuts that the nursery school brought (I promised to buy cider donuts to take home). 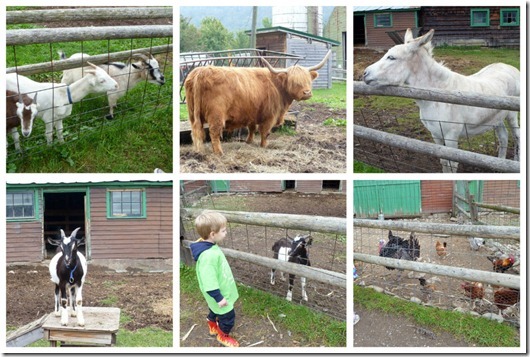 The kids were given money to buy food to feed the animals. I wish I had gotten a shot of JSL – he was brave and tried it, but I was helping him with the machine. The goats ate it too quickly. 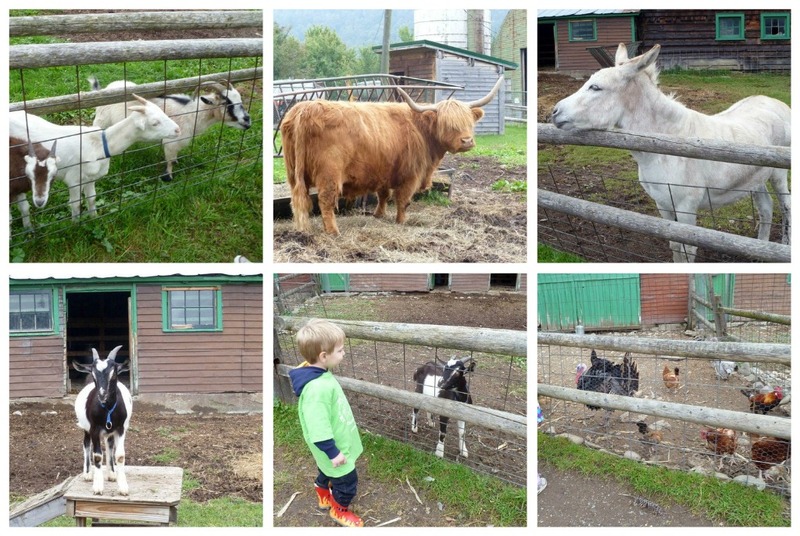 Of course, there were even more animals down a bit from the first group. 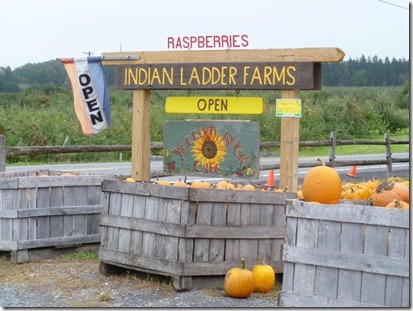 Then, it was time to say goodbye to everyone from nursery school and head into the Indian Ladder Farms store. 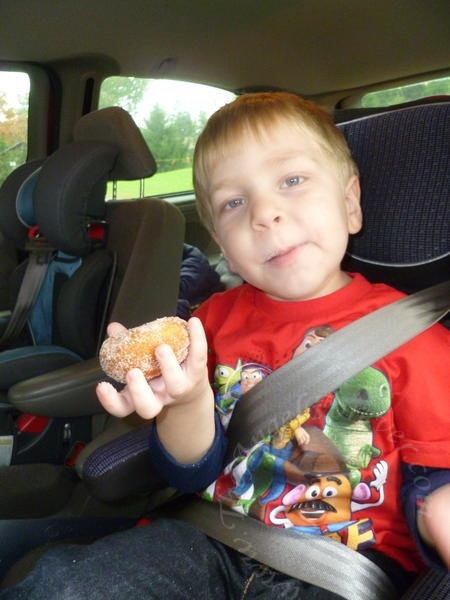 Here, we picked up from cider donuts and a bread for home. 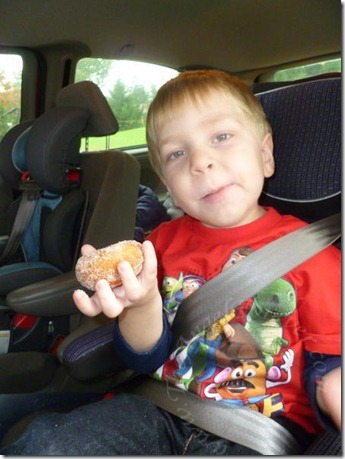 Of course, JSL was able to have one of the donuts in the car since that is a tradition after going here. 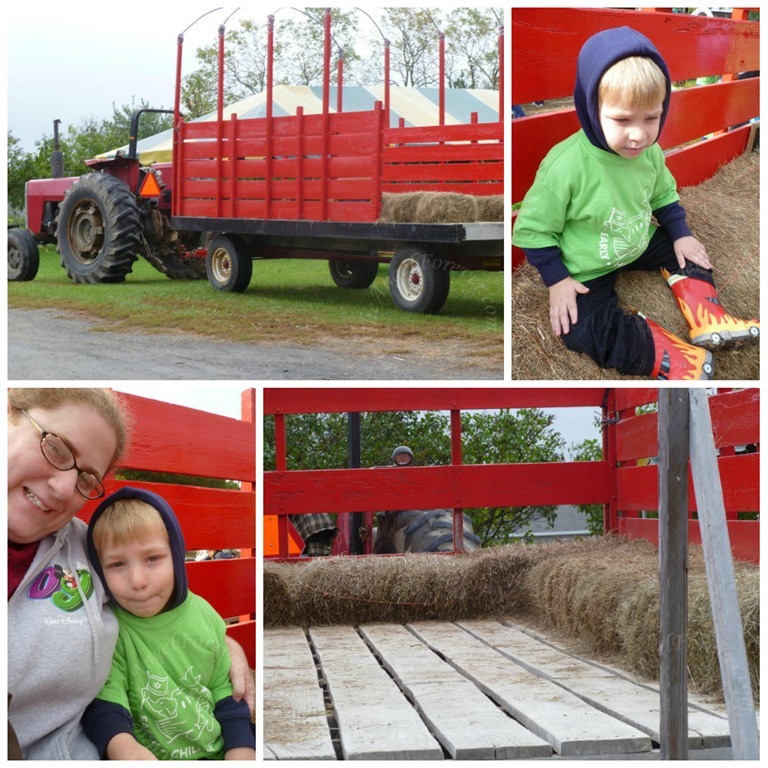 Despite the rain that greeted us in the morning, we had a fantastic time at the apple picking location. I know that JSL and I will have fun thinking of ways to use all of the apples we picked and heading back with the rest of our family to get more apples soon. Have you gone apple picking this year? If you have what are your plans for all of your apples? Suddenly, I have an overwhelming desire for warm cider donuts. We haven’t made it out to go apple picking yet this year, but I think we’ll have to go this weekend – if only for the cider donuts!